You are currently browsing the Gluten Free For Good blog archives for November, 2011. I’m a bit of an odd duck. I ate these roasted Brussels sprouts and cipollini onions over a mix of creamy sweet brown rice and oats—for breakfast this morning. Yes, for breakfast. And trust me, it was off-the-charts delicious. Monday is my organic food delivery day. I belong to Grant Family Farms CSA and I’m the grateful recipient of 26 week’s worth of organic veggies, fruit and pastured eggs. I’ve been a member of Grant Farm’s CSA program for 5 years now and I’ve gotten very good at using up my bounty. BUT, it’s not easy unless you shift your thinking and eat vegetables for breakfast as well as lunch and dinner. I’m more than happy to do that as I’m a plant girl at heart. If you prefer keeping Brussels sprouts at arm’s length, try them for breakfast. They’re ridiculously healthy and taste wonderful if you cook them right. Here’s how. Adjust ingredient amounts according to how much you want to make. The above photo was a single portion made in my grandmother’s small, cast iron skillet. Okay, it might have been a double portion, but I made it a single serving. Cipollini (pronounced chip-oh-lee-nee) onions are small, mild and very sweet. Perfect for breakfast. 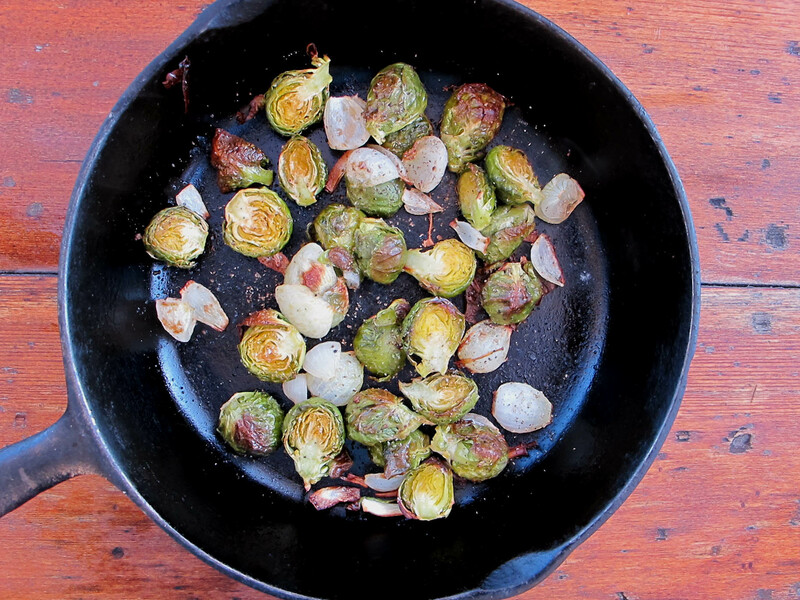 The pinch of brown sugar and the natural sweetness of the onions carmelizes and sweetens the Brussels sprouts. They’re a delightful pair. Wash and trim Brussels sprouts, cut in half. Peel onions and cut in quarters. Place sprouts and onions in a small bowl. Add olive oil and mix well. Grind pepper over bowl (several grinds), sprinkle with salt (I like a good amount) and brown sugar (about 1/2 to 1 teaspoon). Mix well. Pour veggies into lightly oiled cast iron skillet and place on center rack of pre-heated 400 degree oven. Roast for 20 minutes. Pull skillet out of the oven and mix veggies to insure all sides get roasted. I usually add another pinch or two of sea salt, another grind of pepper and a pinch of brown sugar. Place back in the oven for another 10 to 15 minutes until golden brown. Eat before 6 AM and fly through your morning. Peace, love and breakfast veggies!